So considering all the pain and suffering I went though during our unsuccessful infertility treatments why would I want to deal with a birth family after the TPR paperwork has been signed? They tell me it isn’t co-parenting or associative parenting, but if the birth family is going to take me to court if they don’t feel they have enough access to the child, exactly who is the parent? And exactly why did we pay all those high fees? You bring up some really good points and it’s good that you’re dealing with any fears you may have in a conscious way. The short answer to your question is that you may decide to deal with birth family because this is what can bring a sense of wholeness to your child. Clearly, the path through infertility leaves many wounds. There is no shortage of pain and suffering and unpredictability and powerlessness. But our job a parents is to heal as much as we can from those wounds so that our leftover issues don’t become our child’s issues. Your fear about birth family taking you to court is a real one, but very unlikely to happen with an agency that operates ethically and with placing parents who are counseled well (in an ethical agency, this is why you pay high fees). It’s kind of like saying you’ll never eat out in a restaurant because you saw on the news once that someone got food poisoning. Sure, it happens, but it’s relatively rare. I think it’s normal to come at adoption from an Either/Or perspective — either YOU are the mom or SHE is). When you say, “exactly who is the parent?” I’m guessing you’re thinking of adoptions from the era in which we kept things closed and hidden, sometimes to the detriment of the adoptee. That’s what most of us “know” about adoption. It’s possible — and not difficult! — to embrace instead a Both/And heartset. The birth family is an extension of your child. It is his/her beginning. I don’t think open adoption is ALWAYS the right answer, but your child is and always will be part of his/her birth family, therefore, having an open heart is very important! Being not an adoptive parent or adoptive child I can only speak from a place of love and concern for friends of mine who adopt and friends of mine who are adopted. Though I can imagine it must be so challenging for the adoptive parents, I have to believe that in the long run having some sort of connection to a child’s biological roots could only help in the long run. Thank you for such a thoughtful piece. I’m not in the adoption community but I find the openness to new ways thrilling, in some way. I am an adopted adult. I never really got open adoption until a family member was a birth mom. She talks to adoptive family and receives pictures. This worked nicely. Better for both and less secrets! 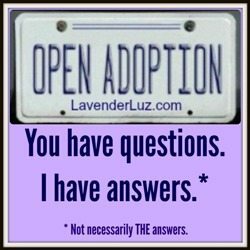 Most “open” adoptions– up to 70%, according to researcher Karen Wilson Buterbaugh– slam shut on first mothers, often with no warning. “Open” adoption agreements are only very rarely legally enforceable. The mothers are disposable, and are disposed of, just like in the old days. I know of many open adoption families who do not consider mothers as disposable, but rather integral to their child’s — and thus their family’s — well-being. I’d love to see that research. I believe people should live up to their agreements. I believe honor and integrity are among the important things that parents can teach their children. Life well lived indeed! Love this Lori! In discussing open adoption you must first recognize that the term is used to describe a variety of different arrangements from letters and photos to actual visits. Problems arise when the terms is not defined and the mother thinks it means visits and the paps have no intention of doing that. Birth mothers also are very seldom aware that contact agreements are basically unenforceable. Adoption is NOT shared custody as in divorce where both parents maintain parental rights. In adoption the birth mother and father loose ALL rights! the child is legally the aps and they then have every right to stop any visitation or contact at will. As for why agencies suggest it? Simple! to increase their supply of babies for adoption. It’s a sales pitch. It softens the blow of loss if you convince a mother it will be”open” without explaining what that means. Far too many end in disappointment and feelings of betrayal. Yes on the variety of meanings that “open adoption” has to different people. Many seem to equate openness with contact (see https://lavenderluz.com/2013/01/open-adoption-grid.html for why I consider them different measures). We need to begin looking at such adoption arrangements (in which the birth parents choose the adoptive parents and work out their expectations for how things will unfold) as long-term relationships of interdependence, not a zero-sum competition (“for me to win, you must lose”). People in relationships that have high value to all involved work hard to avoid betraying one another. When an adoption begins and ends with birth prospective adopters meeting before birth is NOT open adoption . calling it so is a misleading (often intentionally) use of the term. This is an identified adoption” which may or may nor be open, or semi-open. Lori – “long-term relationships of interdependence” without competition is a nice IDEAL. But what is needed is legal protections against false and broken promises in so-called open adoptions. We cannot legislate people’s feelings but we MUST regulate adoption so that it is ethical and honest not deceitful and betraying. Without ethical guidelines and regulations the rest is all flowery rhetoric. Open adoption needs to stop being used as a marketing tool, as shame once was. Perhaps there is room for a two-pronged approach, Mirah: changing policy and laws to MAKE people treat each other respectfully, and changing people’s hearts to make them WANT to treat each other respectfully.